This article appeared in American City & County's July 2012 issue with the headline "The safety net." “This is going to transform public safety communications the same way that two-way radio did in the 1930s,” said Charles Dowd, deputy chief for the New York City Police Department, shortly after Congress passed payroll-tax legislation in February that included reallocating the 700 MHz D Block spectrum to public safety and $7 billion in federal funding to help pay for a nationwide wireless broadband network for first responders. 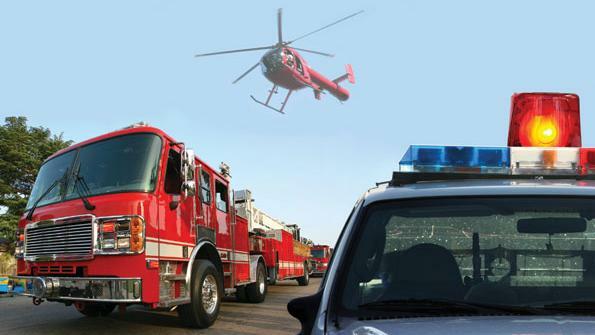 With the D Block, first responders have 20 MHz of continuous spectrum to use as the foundation for a nationwide long-term evolution (LTE) network and eventually almost 40 MHz of airwaves in the 700/800 MHz band. And, while no one believes $7 billion is enough to build a nationwide network completely, it will provide a much-needed financial jumpstart to a long-awaited broadband initiative. Indeed, public safety’s prospects for that type of network appeared to be bleak three years ago. The original 10 MHz of public safety broadband spectrum in the 700 MHz band was licensed to the Public Safety Spectrum Trust (PSST), an organization chaired by longtime public safety advocate Harlin McEwen, that had no funding resources. Subsequently, the FCC’s public-private partnership proposal for building the network that would be shared by commercial interests and first responders failed to generate a qualified bid for the D Block — 10 MHz of spectrum adjacent to public safety’s broadband airwaves — during the 700 MHz auction held in 2008. By 2010, the FCC released its National Broadband Plan, which called for the D Block to be auctioned to a commercial operator and sought $6.5 billion in federal funding to help pay for a broadband-network buildout for first responders. Also, public safety officials began working together via an ad-hoc coalition that would become the Public Safety Alliance (PSA). However, with the FCC planning to auction the D Block, many questioned whether any realistic chance to secure that spectrum for first responders existed. Suddenly, the D Block no longer was simply a public safety issue but one that was supported by organizations representing most elected officials in the country — a reality not lost on Congress. First, Rep. Peter King, R-N.Y., introduced a bill to reallocate the D Block. Then, Sens. John McCain, R-Ariz., and Joseph Lieberman, I-Conn., introduced legislation calling for D Block reallocation and funding for public safety. On top of that, Sen. Jay Rockefeller, D-W.Va., — chairman of the Senate Commerce Committee, which oversees the FCC’s budget — also expressed his intention to offer similar legislation. Still, it would take an act of Congress to reallocate the spectrum to public safety and secure the funding, which had become even more critical as local and state jurisdictions struggled with budgets squeezed by a dramatic recession. However, by 2011, the conversation on Capitol Hill regarding the public safety network had changed from “if it should be done” to “how it should be accomplished.” There was general consensus that a nationwide network should be in place, and the 10th anniversary of 9/11 helped remind lawmakers of the communications need throughout the year. While there still was not complete agreement on all aspects of the proposal, the bigger problem was that Congress was so divided along partisan lines that very few pieces of meaningful legislation were being enacted. Proponents repeatedly tried to attach the public safety network language to larger bills that were perceived as “must-pass” legislation, only to determine later that even supposedly must-pass bills were not going to be approved in this dysfunctional Congress. Indeed, many Beltway observers saw the payroll-tax-cut legislation as the last chance for public safety with the current Congress. After a well-publicized snafu in their handling of the bill in December, Republicans lost a lot of political leverage and needed to get this legislation approved. Beyond that, most Beltway observers believed that pre-election partisan politics would prevent other significant bills from being enacted until a new Congress takes office in 2013. Great, more strings attached and more central control. Because we really can make it a perfectly “safe” world where nobody gets hurt right?